Gifts For Gin Drinkers - What's Goin' On In The Kitchen? We all know that one person right? The gin drinker who can’t stop talking about gin, at work, at home, and even while drinking a gin. 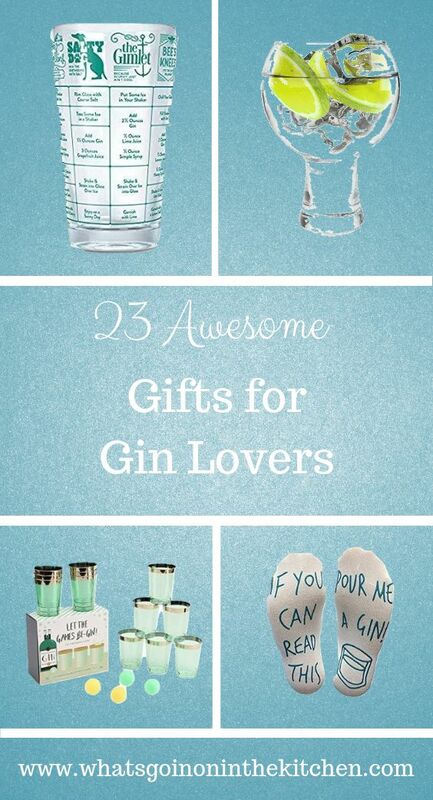 I have searched the internet and found some of the best gifts for gin drinkers available. Use this gift guide to find the perfect gift for the gin lover in your life. If you are interested in other cool drink products then check these out. This Real Gin Making Kit is one of the perfect gifts for gin drinkers everywhere. Combine the fun of drinking your own flavored gin with the enjoyment of designing and crafting your own with this awesome kit. This kit is great for beginners and professionals alike, teaching you to make drinks such as the Rosemary Salty Dog, Cucumber Tongue Cocktail, a master Gin Martini, and more with the Fully Colored, Fully Illustrated Ultimate Guide to Gin Making which is included with this kit. This kit also includes 2 all glass bottles with custom labels, a one of a kind personalised stainless steel flask, the Ultimate guide to gin Making and a fine selection of herbs to flavor your favourite gin. View here for more details. Make sure your gin drinking friends and family measure just the right amount of gin for their cocktail with this Gin Cocktail Measuring Glass. This glass features 7 delicious cocktail recipes all featuring your favorite gin. Using this glass will turn you into a bartender in no time, with recipes for Gin and Tonic, Tom Collins and more. This awesome glass comes packaged in a colorful gift box, making it the perfect gift for your favorite gin drinking bestie. For pricing and more information view here. These Comedy Gin Socks make a great addition to our list of gifts for gin drinkers of all shapes and sizes. Gin lovers everywhere can use these socks to let their loved ones know when it is time for a fill up of their favorite beverage. View a selection of comedy gin socks here. What better smell could there be in a gin lovers house than the smell of Gin Scented Candles. Just light them up and smell the gin as the aroma fills up the whole room. For a whole selection of Gin Scented Candles look here. This awesome Spherical Food Maker will make you the talk of any dinner party. 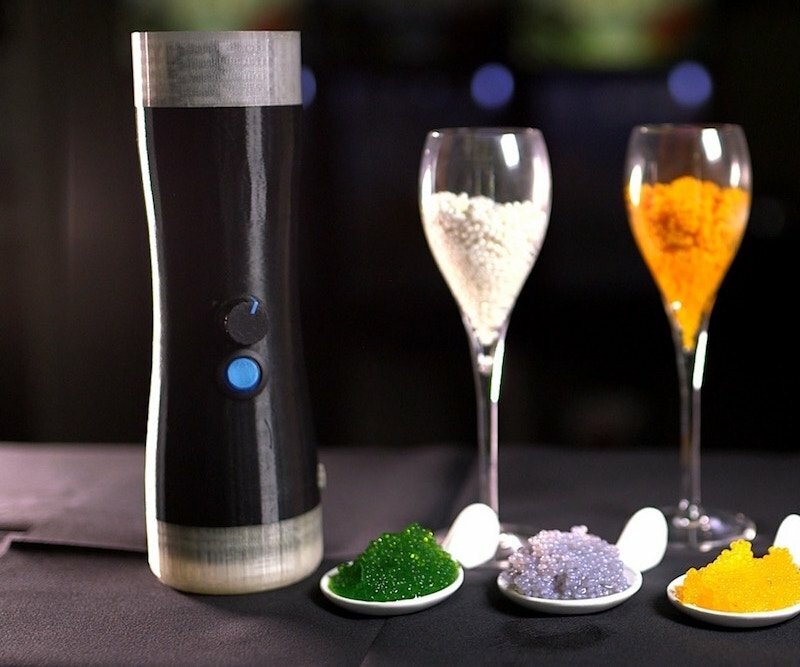 This nifty invention will turn almost anything into tiny caviar-shaped pieces within seconds. This is a great tool for foodies, chefs, bartenders, and anyone who loves to entertain! With this in your kitchen you’ll be able to experience caviar-like food every day of the week. Gin lovers can turn their favorite flavor of gin into these tiny edible spheres of loveliness within seconds. To add this to your own collection of gifts for gin drinkers look here. There is a huge selection of these Hilarious Gin Water Bottles online. Gin drinkers can double bluff their work colleagues into thinking they are not drinking gin during the day (not recommended). These water bottles are just one of the great gifts for gin drinkers we found online. To view more see here. These gin coasters will make a perfect addition to any gin lovers coffee table. They are made from eco-friendly bamboo, which does not retain water, meaning they will not warp or crack. The high quality coasters are sturdy, with a smooth finish. For more information about these gifts for gin lovers check here. Give the gin lover in your life the gift that keeps on giving with this canvas tote bag. Not only can it be used for carrying everyday essentials, but also for carrying their favorite tipple home from the supermarket. To view a selection of these canvas tote bags click here. This is the perfect kitchen gin accessory for gin lovers. This two sided large cutting board comes stacked with 50 gins to try before you turn 50 on one side, and the other side is the perfect surface for preparing your favorite gin, chopping lemons and smashing mint and any other gin garnishes you desire. Get this awesome gin cutting board here. Ok so maybe this is taking it too far in our search for the ultimate lis of gifts for gin drinkers. Now your gin drinking loved ones can bathe in and smell like their favorite drink all day long. Instead of your mouth feeling refreshed and quenched, it will be your body that feels nourished and revitalised with this gin and tonic body wash. Click here for more details. Apparently according to this gin tea cup and saucer set, ‘Gin is always a good idea’. 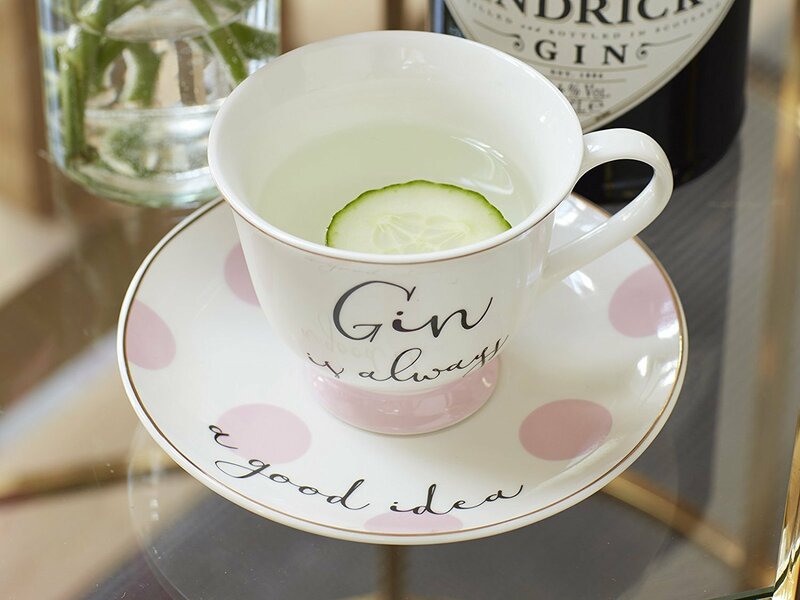 Made of fine china and delicately shaped, your gin loving friends and family can enjoy a gin in sophisticated style at the end of the day with this cute cup and saucer set. To view more details about number 11 on our list of gifts for gin drinkers look here. These gin fizz flavor sweets are infused with real gin to give a satisfying gin taste. Blended with lemon, these sweets are topped with a sweet and sour sugary fizz, and are presented in a glass sweet jar. Non alcoholic and gluten free, these sweets contain only natural colours and flavors. Give your best gin drinking friend the gift that gives the taste of gin all day long. To buy these sweets look here. Whilst not exactly making you smell like gin all day long, this Juniper fragrance is based on London dry gin. It is made with a fresh mix of juniper berries, angelica, brandy, black leather, cardamom and amber. It is in our list of great gifts for gin drinkers because it is a beautiful smelling fragrance that will be a hit with gin lovers everywhere. Click here to buy this today. This luxury silver handbag, hand finished with ribbon is one of the most perfect gifts for gin drinkers that also enjoy the luxuries in life. This Gin & Tonic handbag contains a nourishing lip balm and bath salts to pamper your gin drinking loved ones. To get this gift for someone special today click here. Gin Glorious Gin charts the history of London through its most iconic drink. This book takes the reader though the Georgian City via the Gin Craze, through the empire (courtesy of a G&Ts) to the up to date cocktail bars in the west end. This is the perfect book for those with a keen interest in the history of London, or the love of its most famous drink. To read this book click here. Get your gin loving friend the perfect gift for christmas by choosing from a fine selction of gin Christmas jumpers like the one above. Ensure you’re gin drinking loved ones are full of Christmas spirt with number 16 on our list of perfect gifts for gin drinkers by clicking here. This awesome Ginsanity Copa Cocktail Glass is the perfect glass for your gin drinking friends. Made in a single bubble design and dishwasher safe, enjoying a gin out of this glass will look and feel pure class. To see this glass view here. Gin time can be whenever you want with this awesome Gin O’clock Watch. With a genuine leather strap, silver tone case, crystal glass and stainless steel back, this watch is just the timepiece for making sure your gin drinking loved ones never miss their favourite tipple. Check out this watch here. Another one of those gifts for gin drinkers that keeps on giving, this book is an awesome collection of over 40 of the best drinks for serious gin lovers. This book features all the classics like Gin Fizz, Martini, and Gimlet, and also features the likes of Pink Lady, a Negroni, and a Rhubarb Sparkler, meaning that it caters to every gin taste! Get this book here today for gin lovers everywhere. Anyone for Gin Pong? Like beer pong but with gin, this is the perfect drinking game for you and your gin loving friends. The kit contains everything you need to get the party started, including 12 plastic gin tumblers, 2 green and 2 yellow ping pong balls. You will need to buy your own gin though! Get this cool party kit here today. These super cool Gordon’s Gin Bottle Wall Clocks are made from recycled glass bottles to give that authentic gin bottle look. Each bottle is made from a genuine Gordon’s Gin bottle, and comes with a hook for easy wall hanging. Make sure it’s always gin o’clock in your favourite gin lovers house with this clock. Get yours here. This quirky Gin and Titonic Ice Cube Tray provides the perfect ice cube for your favorite gin drink. Made from food-safe synthetic rubber, this mold consists of four ocean liner molds and four iceberg molds. Get this ice cube tray here for the perfect addition to any gin based drink. No list of gifts for gin drinkers would be complete without one of the most famous brands of gin out there. Hendrick’s Gin is the perfect gift for all gin lovers. This gin consists of flowers, roots and seeds complimenting the two main infusions of rose petal and cucumber. Hendrick’s Gin is infused with Bulgarian Rosa Damascana and specially selected cucumbers, to make it in our opinion the tastiest gin there is. Complete the line up here for your gin loving friends.